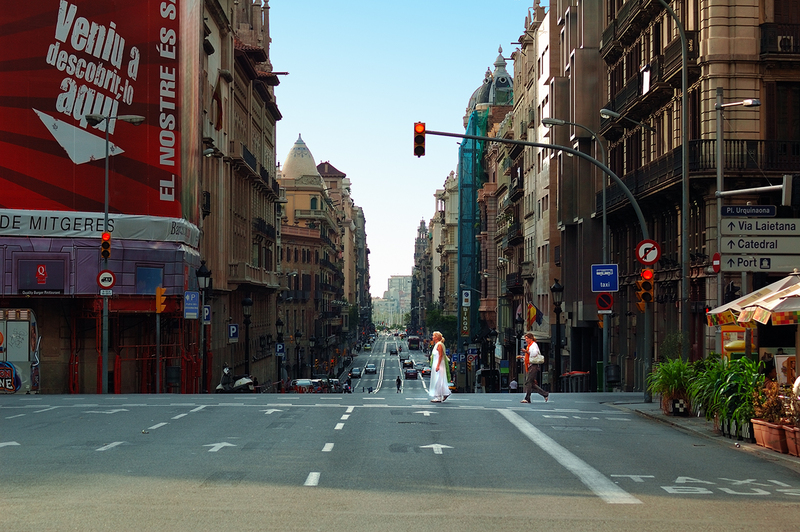 Via Laietana, is normally a very busy street in Barcelona but not much if you go early on weekends. Via Laietana was first projected in 1879 and started in 1907, with the aim of communicating Eixample with the waterfront, amid much controversy. The demolition of a large number of houses and the removal of the streets in the area was required to do so. As some of the traditional guilds of the city, some dating back to the Middle Ages, were located there, they had to be relocated in different parts of Barri Gòtic, notably Plaça de Sant Felip Neri. The first section to be built was named Carrer de Bilbao, which nowadays is a separate, shorter street that stems from the larger Via Laietana. The avenue was finished in 1926. Francesc Cambó, a prominent politician of the time, built his personal residence in the avenue. During the years of the Spanish Civil War (1936-1939) it was renamed Via Durruti. Check this interesting movie walk related to Via Laietana where they also show a map of Erasmus students in Barcelona in the vicinity of the famous street. What a stunning photo, particularly with the woman in white. She catches your eye and makes you ask, "What is her story?"